President George W. Bush of the United States and Crown Prince Abdullah of Saudi Arabia meeting at Bush's ranch in Crawford, Texas, April 25, 2005. This incident caused quite a stir in the United States, where it is unusual for men to hold hands. 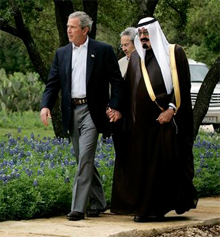 In Saudi Arabia, on the other hand, men hold hands as a sign of respect and affection. The stir in the U.S. can be viewed as an example of insisting on "doing it my way." See "Why Arab men hold hands," by Hassan M. Fattah, in The New York Times, May 1, 2005. White House photo by David Bohrer, courtesy Wikipedia. Daily, we engage in dozens or hundreds of social transactions. We greet others; we say farewell; we yield (or not) in hallways, on the street, or entering elevators; we shake hands, wave, or hug; we hold doors open for others; we let doors close; we place lunch or latte orders; we leave voicemail; we send email thanks; and on and on. We can choose from dozens of different approaches to these engagements. There are degrees of intensity, cheerfulness, and enthusiasm. Usually we make these choices without thinking much about them. Some social transactions are reciprocal: one party initiates, and the other responds. Each chooses a style, more or less voluntarily. Waving hello from afar is an example of a reciprocal transaction. Other social transactions are mutual: the two parties usually engage in the transaction in similar styles, because of the nature of the transaction. Shaking hands and hugging are examples of mutual social transactions. In mutual social transactions disagreements as to style are awkward at best. They can even result in insult. One stance that leads to disagreement is insisting on doing it one's own way, despite the preferences of the partner. Another stance, perhaps even more problematic, is being completely unaware that one's own way is just one way, and that it might differ from the partner's. The former entails at least an acknowledgment that others have a point of view, while the latter might be considered a form of cultural ignorance. Here's an example of a disagreement. Interviewers of candidates for employment report that occasionally, at the end of an interview, when the interviewer extends a hand for a parting handshake, the candidate will approach for a hug, effectively brushing aside the extended hand, saying, "I'm a hugger." In effect, the candidate says, "We're doing it my way." can even result in insult.expensive. Whether we have the greater power or not, we tend to accept this resolution, but when viewed from outside the power system, it's clear that using power to settle differences in approaches to social transactions is no more fair or right than is using any other form of coercion. Would you like to see your comments posted here? rbrenhDBGrgBcnXenGpKPner@ChacrsPclUJYKOpBiLvMoCanyon.comSend me your comments by email, or by Web form. I offer email and telephone coaching at both corporate and individual rates. Contact Rick for details at rbrenayWGuzHZUJzKZZXSner@ChacWRiDwtHGBjsfBhbtoCanyon.com or (650) 787-6475, or toll-free in the continental US at (866) 378-5470.